We would like to invite you to the workshop “How can policy and regulation support resource recovery from waste?” on 21st September 2017 in Durham, Kenworthy Hall at St Marys College. This workshop is organised as part of a collaborative mini-project by the Resource Recovery from Waste programme and associated researchers of the AVAnD, B3, MeteoRR and R3AW projects. This is a one day workshop on Vanadium recovery from steel slag landfills. At this workshop, you will gain insight into the Resource Recovery from Waste programme and the technologies developed within our projects. You will get the opportunity to share best practice in policies and regulations that enable resource recovery, while also highlighting any barriers that may exist. We will use the project findings in our work striving for positive change in government policy supporting a circular economy in the UK. Understanding how change in the governance of waste and resource management can be achieved is vital to promote resource recovery and increaser resource efficiency as part of the transition towards the circular economy. Based on this research, we will formulate policy recommendations for governmental bodies throughout the UK.Each workshop strives to answer the question: “If we wanted to realise resource recovery in the UK, how would it be possible within our policy and regulatory context?” We will ask for your knowledge and experience to carry out a policy analysis, identifying drivers and barriers for resource recovery in general and for specific technologies, and identify which actors could drive required changes in the policy and regulation landscape. This workshop aims to bring together people from academia, government, and industry. Please contact Anne Velenturf A.Velenturf@leeds.ac.uk to register for the workshop. Workshop spaces are limited and will be allocated on a first come, first serve basis. The next 14th July 2017, the School of Environmental Sciences of the University of Hull will host the CIWM North East Centre & IOSH Environmental & Waste Management Group Joint Open Meeting. Professor Dan Parsons from the Institute of Energy and the Environment will welcome the participants and Dr Pauline Deutz will present a talk “Circular economy and resource security: recovering metals from legacy Wastes“. New paper in ES&T on vanadium leaching from steel slag published! Our latest paper on the leaching of vanadium from steel slag is published open access in Environmental Science and Technology this month. Vanadium is a potential aquatic pollutant that can be released when steel slags are weathered, either during disposal or in conditioning of the material so it can be re-used as aggregate. Our study aimed to improve our understanding of how vanadium is released from slags into the surrounding environment using a range of geochemical techniques. We found that vanadium is more readily released under aerobic conditions and that its release to water is controlled by calcium vanadate mineral phases. We also observed significant accumulation of newly-formed calcium silicate hydrate (C-S-H) phases in a rind around the surface of slag that is weathered. These surface minerals are also important in taking up some vanadium from solution. An understanding of these weathering processes helps give us greater insight into the potential environmental risks of slag processing and re-use. The observed leaching and precipitation processes on the surface of the slag have positive implications for slag after-uses (e.g. as an aggregate). The presence of a surface rind may limit (or significantly slow) further dissolution, preventing significant alkalinity generation or the release of metals to the environment. Can slag heaps help save the planet? A new research project with Dr Phil Renforth (Cardiff University) has been highlighted in The Guardian. You can read the full article here. This new three-year project, which has just been awarded a £300,000 grant by the Natural Environment Research Council (NERC), aims to to test the feasibility of using iron and steel slag deposits to remove carbon dioxide from the atmosphere and it is set to begin in Consett, County Durham, and Port Talbot, south Wales. During the process of steel-making, iron ore is mixed with limestone or dolomite and heated to extremely high temperatures. The end results are steel and slag, a waste mixture of calcium and magnesium silicates and oxides. Piles of this ore-processing leftover have been dumped around the countryside over several centuries. Earlier research by Renforth has shown that carbon dioxide from the atmosphere is absorbed by material inside slag heaps. “We now want to see if we can improve the rate of this absorption so that can we make significant reductions in atmospheric levels of carbon dioxide in the future,” added Renforth. To do this, Renforth’s project will proceed in two stages. “First, we will drill into one of these old, historic slag heaps and see what has been happening there over the years and understand what chemical processes have been going on as rainwater has brought carbon dioxide into the heap. “And then we will start the second stage. We will create our own mini-heap – about the size of a skip – and play with its chemistry to try to optimise its ability to sequester carbon from the atmosphere.” These slag-based carbon sequestrators could then be used as models of larger devices that could reduce carbon levels in the atmosphere, Renforth added. Our team has now available a Ph.D. opportunity at the University of Leeds on “Long-term management of leachates produced from highly alkaline bauxite residues” with Dr Ian Burke (SEE), Prof Doug Stewart (Civil Eng), Dr Will Mayes (Hull) and Amiel Boullemant (Rio Tinto Legacy Management). Investigate the fate and mobility of soluble metals (Al, As, Mo. V) in relevant leachate management systems (e.g. neutralisation, re-circulation) using a combination of on-site measurement and laboratory experimentation (with synchrotron and electron microscopy based characterisation of metal(loid) speciation in the solid phases produced). Determine the effectiveness of residue treatments (e.g. in situ neutralisation, carbonation reactions) for controlling trace metal(loid) leaching and their long-term role in promoting residue stability and rehabilitation/ revegetation prospects. Investigate the fate of released oxyanions (chiefly V) in natural environments receiving treated leachates in order to understand the role of interactions with soil minerals and organic matter in controlling metal(loid) mobility and risk. Out team just published a new paper on vanadium recovery from red mud leachates using ion exchange resins. The paper is available on open access here. Bauxite residue or red mud is an important by-product of the alumina industry, and current management practices do not allow their full valorisation, especially with regard to the recovery of critical metals, like vanadium. 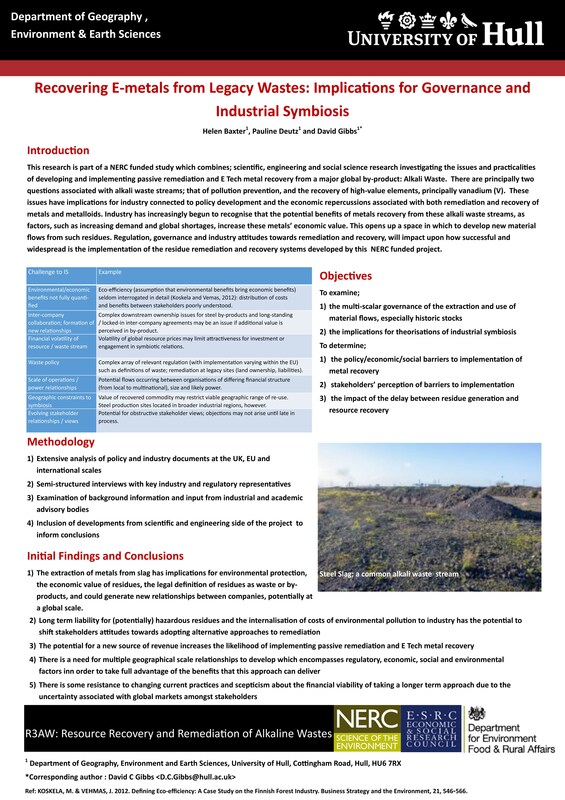 This paper focus on vanadium removal and recovery from the leachates, with emphasis on the environmental remediation of bauxite residue disposal areas or closed legacy sites where vanadium is both a contaminant and a metal with economic interest present in the effluent. As an environmental pollutant, removal of vanadium from leachates may be an obligation of bauxite residue disposal areas (BRDA) long-term management requirements. Vanadium removal from the leachate can be coupled with the recovery, and potentially can be used to offset long-term legacy treatment costs in legacy sites. This study has shown that anion exchange resins can be used for metal removal and recovery from bauxite residue leachates in a highly alkaline pH range (up to 13). The results showed that using simulated undiluted bauxite residue leachate as feed solution limited the resin efficacy, due to the presence of competing ions. However, the resins are very effective at V removal for simulated post-closure bauxite residue disposal areas (BRDA) effluent. In the column experiments, V was readily eluted from the resins in concentrations similar to some industrial process liquors, which holds promise for recovery and recycling of V into downstream industrial processes. Further research is required to scale-up laboratory findings. This should include assessment pretreatments and optimisation of operating parameters, such as flow rate and bed height. This will help facilitate life cycle assessments of anion exchange resins as a potentially efficient and cost-effective option for both the treatment of bauxite residue leachates and the recovery of metals of critical importance such as vanadium. The paper “Advances in understanding environmental risks of red mud after the Ajka spill, Hungary” was just published in the Journal of Sustainable Metallurgy. This paper reviews the over 45 scientific studies published in the last 5 years assessing the key risks and impacts associated with the largest single release of bauxite residue to the environment – the 2010 Ajka red mud spill. Categories of scientific papers and conference proceedings after the Ajka spill. The main environmental concerns were covered in these studies, which also evaluated the effectiveness of the remedial actions taken. The key immediate risks after the spill were associated with the highly caustic nature of the red mud slurry and fine particle size, which once dry, could generate fugitive dust. Studies on affected populations showed no major hazards identified beyond caustic exposure. The dust risks were considered equal or lesser to those provided by urban dusts. The longer term environmental risks were related with the potential salinization of inundated soils and release and potential cycling of metals and metalloids (e.g. Al, As, Cr, Mo, V) in the soil-water environment. Of these, those that are soluble at high pH, inefficiently removed from solution by dilution and likely to be exchangeable at ambient pH are of chief concern (e.g. Mo and V). However, extensive management efforts in the aftermath of the spill greatly limited these exposure risks through neutralisation and red mud recovery from affected land. Monitoring of affected soils, stream sediments, waters and aquatic biota (fungi, invertebrates and fish) have all shown a very rapid recovery towards pre-spill conditions. The accident also prompted research that has also highlighted potential benefits of red mud use for critical raw material recovery (e.g. Ga, Co, V, rare earths), carbon sequestration, biofuel crop production and use as a soil ameliorant. We presented a poster at the Symposium “Renewable chemicals from waste – securing the molecular value from waste streams” in the Royal Society of Chemistry, London, the 20th November. We displayed some preliminary results from the experiments on vanadium recovery from steel slag leachate with a commercial ion exchange resin. Challenging pollutants such as vanadium are released during leaching of alkaline wastes . While it is contaminant of concern, vanadium (V) is also highlighted in recent strategic reviews of mineral security as being of critical importance to green technologies (with other elements such as La, Li, Co, V, Te, Ga, Se). Our results demonstrate for the first time the extended alkaline pH range over which anion exchange resins can be used for metal removal and recovery from waste leachates. These results are promising for both the treatment of hazardous alkaline leachates and the recovery of metals of critical importance. Ongoing experiments are scaling-up the resin columns for pilot scale. A new review paper on alkaline wastes is now online, after been accepted by the Journal of Cleaner Production. This paper focuses on the environmental impacts associated with alkaline residues, such as coal fly ash, bauxite residues or red mud, steelworks slags, concrete crusher fines, flue gas desulphurisation waste, Air Pollution Control (APC) residues, Solvay process waste, and chromite ore processing residue (COPR). While there are significant differences in bulk mineralogical composition among these residues, all are characterised by the presence of Na, Ca or Mg oxides that rapidly hydrate to produce soluble hydroxides. A large range of Ca and Na silicate, aluminate and aluminosilicate phases are also present, hydrating and dissolving to generate alkalinity. Finally, any Ca and Mg carbonates present provide a stable (low solubility) alkaline phase. Initially, dissolution of soluble Na or Ca hydroxides tends to dominate (pH > 12). The leachates of these residues have pH above typical regulatory thresholds for discharge to water bodies (usually 9), and a major influence on the mobility of contaminants potentially soluble at high pH, because they form oxyanions (e.g. As, Cr, Mo, Se and V). The paper discusses the environmental impacts of the residues, highlighting the acute episodes, such as the dam failure in Ajka, Hungary, as well as the widespread chronic impact of the leachate on receiving waters, especially in old and abandoned disposal sites. Pollutant pressure and biological impacts are also reviewed. The management options for the residues and their leachates are also discussed, distinguishing active and passive treatment options. Potential reuses of these materials, in construction materials, as agricultural amendments, and in environmental applications are identified. The mechanisms of carbon sequestration by alkaline residues are assessed, and the potential for enhancing its rate as a climate change off-setting measure for the industry is evaluated. The potential for recovery of metals critical to e-technologies, such as vanadium, cobalt, lithium and rare earths, from alkaline residues is considered. Finally, research needs are identified, including the need to better understand the biogeochemistry of highly alkaline systems in order to develop predictable passive remediation and metal recovery technologies.